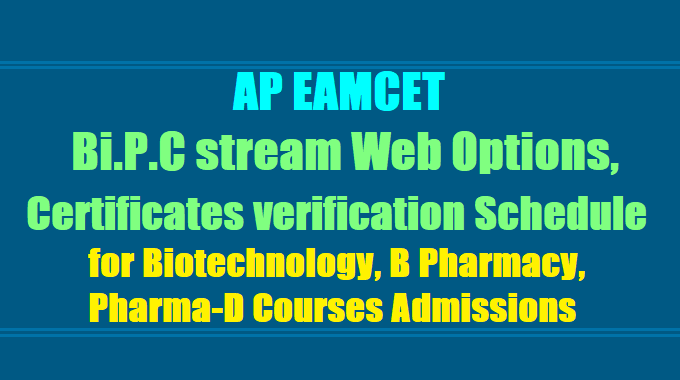 #First Phase AP EAMCET 2018 BiPC Stream Admissions Seat allotment list, Web Counseling dates, Certificate Verification Schedule, Web Options Dates. Certificates Verification and Option Exercise for Web based counselling:: The qualified candidates of A.P-EAMCET-2018 (Bi.P.C Stream) are informed to attend certificate verification in any one the Help Line Centers (HLCs) mentioned in the Annexure-I and as per the schedule given under to take admission in to B.Pharmacy , Pharma-D and Bio-Technology Courses. The details of the ranks distributed Help Line Centre wise for Certificate Verification and all other important information are placed on the Website: https://apeamcetb.nic.in and candidates are informed to visit this website before they go for Certificate Verification. DECENTRALISED WEB COUNSELING SCHEDULE (FOR OCIBC/SC/STIMINORITY) Verification of Certificates of the Candidates for OC/BC/SC/Minority categories will be done in all the Help Line Centres. However, Certificate Verification of ST Category candidates will be done in the Help Line Centres indicated with ** in Annexure-II. LAST Means: Including not qualified/ not appeared in APEAMCET-2018 Minority candidates who have already applied to Convener based on Intermediate Marks. 1. Processing fee can be paid by the candidate using credit card or debit card or through net banking from 07.08.2018.